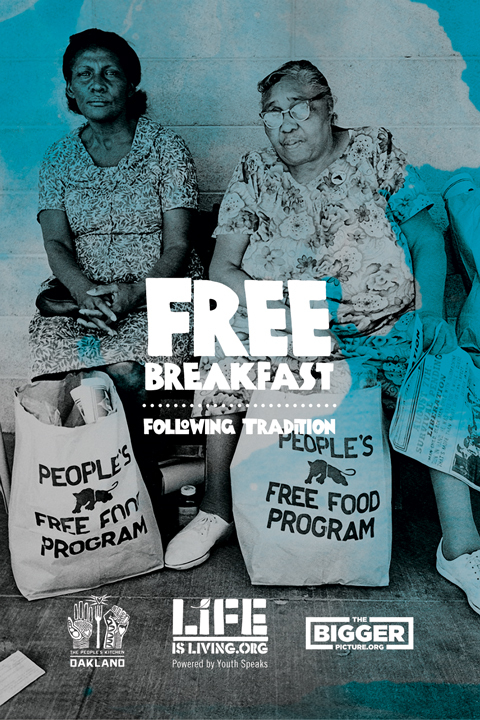 Community Food Rebels: A community meal celebrating Food Rebellion, Resistance and Sovereignty. On October 12th, 2013 A delicious pay-what-you-can meal that celebrated the resiliency of Oakland’s community food rebels was provided for attendees to the Life is Living festival at Defremery Park. It was provided by The People’s Kitchen, People’s Grocery, and Restaurant Opportunity Center. Concept: Imagine the radical beauty of 800 community members sitting down to break bread together and share a healthy, organic, locally harvested breakfast to start their day? Without a doubt, Eating together as a community is Revolutionary and the cornerstone of a powerful community. Being inspired by the brilliance of the Black Panthers, the success of past People’s Kitchen events and the living legacy of food rebels throughout west oakland, we will host A large-scale community meal featuring all local, organic ingredients grown and produced in Oakland. The menu will highlight a number of West Oakland community farms and backyard gardeners. We will create a space where Community can sit together and share a meal while reflecting and building with various social justice movements and political projects in the community. There will be performances from nationally known visual, musical and performance artists. This breakfast will kick off and open the day’s festival. Community will sit and eat together at communal tables spread throughout the street (on 18th st between Poplar and Adeline, in front of the West Oakland library). Each table will be hosted/curated by a different community project. As a table host, you will be able to engage with community members while they eat together at your table. This is your chance to have uninterrupted time to share your work and movement with community while breaking bread together and building relationships. You are responsible for creating a table design that tells the story of your work. This is your way of engaging and mobilizing people around your movement. You will be provided with a standard 6’ table and 6 chairs to surround it. We suggest each table be hosted by 1 or 2 representatives from your organization. You will be sharing a meal with different people at your table throughout the breakfast, this is your opportunity to build closely with community and turn them out to support and engage with your work! Use your table as a tool of engagement and mobilization. Discussion questions to talk to guests with while they dine at your table. In order to make this event a reality, we are requesting that table hosts contribute a sliding scale of $100-500 amount to the project. If this is not a reality for your organization, please reach out to saqib@peoplesgrocery.org we can work something out. Anything you can contribute is needed and will help make this community meal a reality. Checks can be made out to People’s Grocery as they will handle the budget and processing. Regardless, If you are interested in participating in this event, please reach out to saqib and he will get back to you with details and can discuss the financial contribution in person. Layout: Dishes will be finished and served out of a tent in the parking lot in front of the stage. Dishes will be served Family style to each table. 15 Tables will be set up in the street, more will be added based on response from potential partners. Logistics: We will prep cook the food at a nearby commercial kitchen the day prior. Food will be finished the morning of the event and served/plated out of our food tent the morning of. Dishes will be served family style to each table.